Pandas have notoriously sensitive populations, but the coins depicting them are proliferating at least: amid soaring demand the People’s Bank of China has announced higher mintages for 2012 Panda bullion coins. The 2012 mintages for the coins will in some cases double or triple compared to 2011 mintages, according to the June 20 announcement. The decision to increase mintages was reported by state news agency Xinhua and confirmed by a spokesperson for China Gold Coin Corp., the distributor of the coins in China. 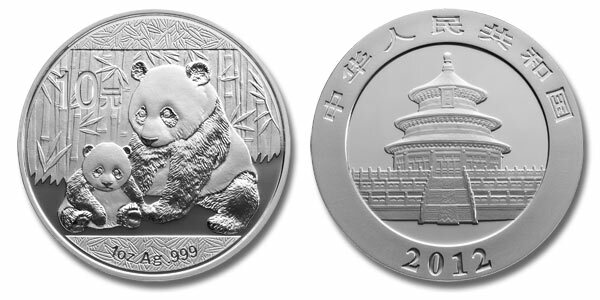 PandaAmerica, the California-based distributor for the United States, also confirmed the increased mintages for 2012, the second consecutive year China has raised mintage figures for the Panda precious metal bullion coins. The stalwarts of the program are the 1-ounce .999 fine silver 10-yuan coin and the 1-ounce .999 fine gold 100-yuan coins; the mintage for the silver 10-yuan coin will double from 3 million pieces to 6 million coins, while the mintage limit for the 1-ounce gold coin is raised from 300,000 coins to 500,000 coins. Four different sizes of fractional gold bullion coins — the 20th-, 10th-, quarter- and half-ounce pieces — will see the largest increases, rising from mintage limits of 200,000 in 2011 to 600,000 next year, per size. “Chinese investors have rushed to buy precious metals this year to hedge against rising inflation,” according to the Xinhua report. In the first quarter of 2011, China became the world’s largest market for gold coins and bars for investment, according to a May 19 report from the World Gold Council, a trade group. China currently issues 10 different Panda coins annually. The six pieces for which mintage increases have been announced are issued as bullion pieces. Four additional coins, 5-ounce and kilogram sizes of both silver and gold coins, are issued in Proof versions and were not discussed in the recent announcement; their mintages will not be revealed until later this year. That doesn’t mean they will immune to increases; mintages for eight of the 10 Panda coins (bullion and Proof combined) rose from 2010 to 2011, in some cases dramatically. 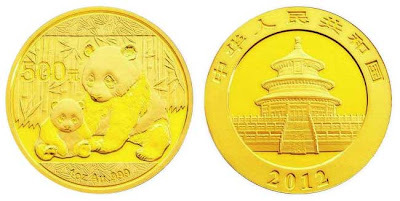 The mintages for small Panda gold coins, those of half-, quarter-, tenth-, and 20th-ounce sizes, were raised from 120,000 each in 2010 to 200,000 each with the 2011 coins, a 67 percent increase. Mintages for some of the large versions were also raised: the kilogram gold coin went from a mintage of 200 pieces in 2010 to a 300-coin mintage maximum this year. The kilogram-sized silver 300-yuan coins for 2011 have a limit of 8,000 pieces, twice the 2010 mintage, and the maximum of 20,000 5-ounce 50-yuan silver coins compares to 10,000 for 2010. But the biggest increase for 2011 was registered for the 1-ounce silver size, as the 10-yuan coin, which had a mintage maximum of 800,000 pieces in 2010, saw its maximum shoot up to 3 million pieces, a 275 percent increase in 2011. The only mintage limits not increased in 2011 were the 1-ounce 500-yuan and 5-ounce 2,000-yuan gold coins, remaining stable at 300,000 pieces and 1,000 pieces, respectively. The accompanying table lists full details of the rising mintage limits from 2010 through the announced limits for 2012. The obverse of each Panda coin shows the Hall of Prayer for Good Harvests (the Temple of Heaven). The reverse design has changed every year since the Panda made its debut, except for 2002, and shows a different design of a panda or pandas. China’s Panda coins are minted at the Shenzhen Guobao Mint, Shenyang Mint and Shanghai Mint, and are generally not identified with a Mint mark. Silver Gold Bull is your trusted precious metals dealer. They will provide you with bargain, up-to-minute pricing and they will make sure your bullion is delivered to your door discreetly and safely.